For the common individual, the only scale that matters is the bathroom scale. However, for those who work in the manufacturing and agriculture industries, a wider variety of scales is needed in order to complete daily tasks. Arguably, the most used scale in manufacturing and agriculture is the platform scale. Before buying a platform scale, three main criteria should be used in deciding which platform scale should be purchased: cost, dimension, and material type. Using these three criteria, a well-informed decision can be made regarding the purchasing of the perfect platform scale. For both personal and business decisions, cost can be a universally important criterion for making decisions. If an item exceeds an individual’s or business’s budget, the ramifications could include not having enough cash flow to fund other future expenses. The same principle of cash management applies to the simple purchase of a platform scale. Before rushing to buy the first available scale, consumers should first evaluate their respective budgets in regards to purchasing an industrial scale. Knowing how much money can be spent will help limit the options a consumer has to consider, in turn creating an easier decision-making process. Once a consumer knows how much he or she can spend on a scale, the consumer should also take the time to figure out how big of a scale will be needed. Determining what the scale will be used for and where it is going to be placed can be very helpful in selecting platform size. Someone who is measuring the weight of pallets of cereal and someone measuring the weight of horses may need two entirely different sized scales. Finally, knowing the exact size needed will help prevent buying a larger scale than needed, reducing the chance of investing too much money in a platform scale. 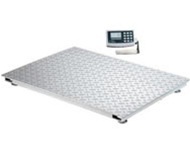 Once a scale’s cost budget and desired size are established, the final decision a consumer should make before buying a platform scale is on whether he or she would like the scale to be made from aluminum or stainless steel. For those with a smaller budget, aluminum platform scales are generally significantly less expensive than stainless steel platform scales. Aluminum scales are also typically lighter than stainless steel scales, so moving them from one place to the next can be an easier task. However, aluminum scales are not as durable as stainless steel scales. Individuals should decide between an aluminum and stainless steel scale based on how can be spent, how often the scale will be moved, and how much abuse the scale may take over its lifetime. For those in agricultural and manufacturing industries, the platform scale can be a vital tool of the trade. Being able to quickly and reliably measure the weight of items can increase job efficiency and reduce potential stress. Anyone who is not using a platform scale should make their job easier by Contact Arlyn Scales for more information or to buy a high-quality platform scale today.